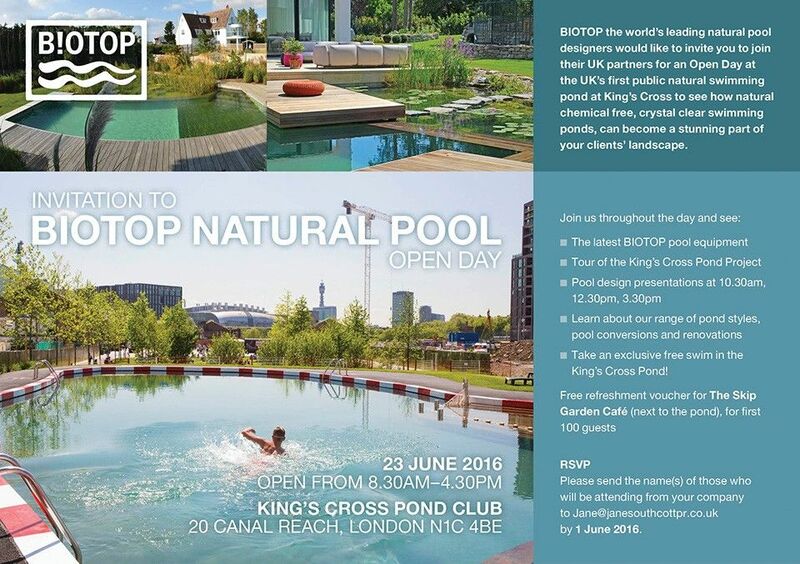 BIOTOP, the world’s market leading natural pool designers are inviting landscape designers, landscape architects and garden designers to a FREE Natural Pool Open Day at the UK’s first Public Natural Swimming Pool at King’s Cross Pond Club, London. Industry visitors to the Open Day will have a chance to meet with BIOTOP’s specialist UK natural pool partners, where they can see the latest pool equipment and also learn about the range of natural pool designs and pool conversion options that are available. Visitors can also take a tour of the unique King’s Cross natural Pond art installation, with the UK partners who built it, Kingcombe Aquacare. Visitors to the event can even take an exclusive dip in the Pond, to try the beauty of chemical free swimming for themselves.